Thank GOD it's Friday. I have had such an emotional week and this girly needs to let loose and drink some goose! LMAO - genius really. I'm a poet. I love a flashback friday and the ironic thing is, this IS a flashback since I'm sitting here wearing my newly tortured platinum blond hair!!!!! LOL - yes, I decided to give it one more go at the blond. This time, the good news is, we're close. One more blast of highlight and we can celebrate in hair dye victory. So, here's my last post as a brunette for awhile! :) Can't wait to show you my new look for my Monday post...what a weekend it's going to be!!! I am going to Rock the Runways, a huge rockin' fashion show party in Portland, OR, and staying over at the Aloft for a slumber party. I'll be uploading mobile photos and goose text updates (sounds better than drunk text, right?) and catch you at my facebook page - www.facebook.com/fatshionchic. Love you guys, have a great weekend!! Wearing all Lane Bryant digs. This is one of my FAVORITE tops EVVEERRR. Seriously, it can go casual or dressy in a flash, and I hate being hot, so no sleeves makes me happy. Plus, it's easy to put a blazer over it with no sleeves, and you know I love my blazers! I love these shoes. I got them a while back at Payless. I have very wide feet, and I was pleasantly surprised the metal circle things aren't too tight. Headed home rocking out. 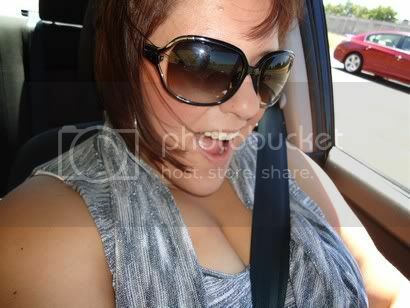 Little me fact - my favorite music is metal/rock, like Godsmack or some Metalica - and I'm in driving heaven! Plus, what is a day without my bucks? 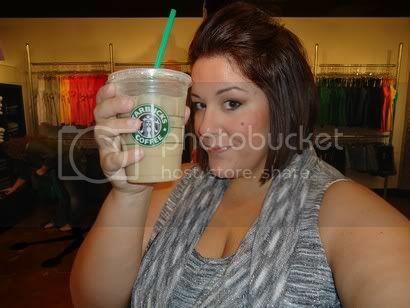 Grande, Iced, Nonfat, Chai Tea Latte, Light Ice please :). Jessica, do you ever have a hard time finding cute shoes at Payless in larger sizes? It seems I can NEVER find anythiing cute in my size. I usually wear a 10, but in heels im an 11. UGH!! You are always rockin the cutest Payless kicks everrr!!! Show us a your must have makeup and every day tutorial!!!! Love the pictures - and the new blog name and layout :-) Will update the Life: Forward (http://TheLifeForward.com) blogroll accordingly!